All too often, mobility is evoked as a preferred indicator in explanations of space-time compression and its impact. However, in failing to clearly distinguish speed potentials from their use, such analyses veer towards technological determinism, or else towards the normative domain. In order to avoid this trap, the motivations underlying mobility must be explored. This groundbreaking examination is carried out through a discussion of the following general question: to what extent can the speed potentials generated by technological transportation systems be considered as vectors of social change? It also provides an opportunity to study in greater depth the little-known field of the sociology of mobility. Following an examination of the existing controversies surrounding social fluidification, it proposes to rethink mobility using the new concept of motility. Current contributions to and research results in this new area are included and the book indicates possible new research directions, opening the way to a new form of general sociology. 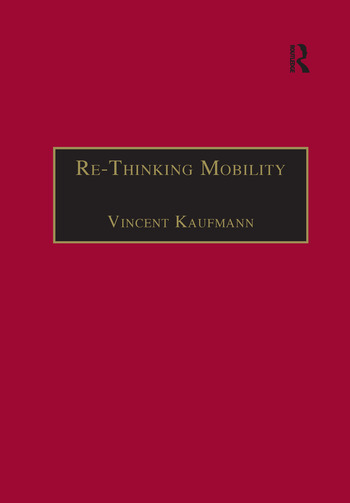 Contents: Introduction; Questioning fluidity; Insights from empirical research; Re-thinking spatial mobility; Mobile, therefore free? ; The use of speed potentials; What inequalities? ; The production of context; Conclusion: towards a network solidity? ; Bibliography; Index. Vincent Kaufmann, Department of Sociology, Ecole Nationale des Ponts et Chaussées, France. Researcher at Ecole Nationale des Ponts et Chaussées in Paris and Swiss Federal Institute of Technology in Lausanne.